Jason Sherman designed a sight-seeing tour to celebrate the history of the Northeast. 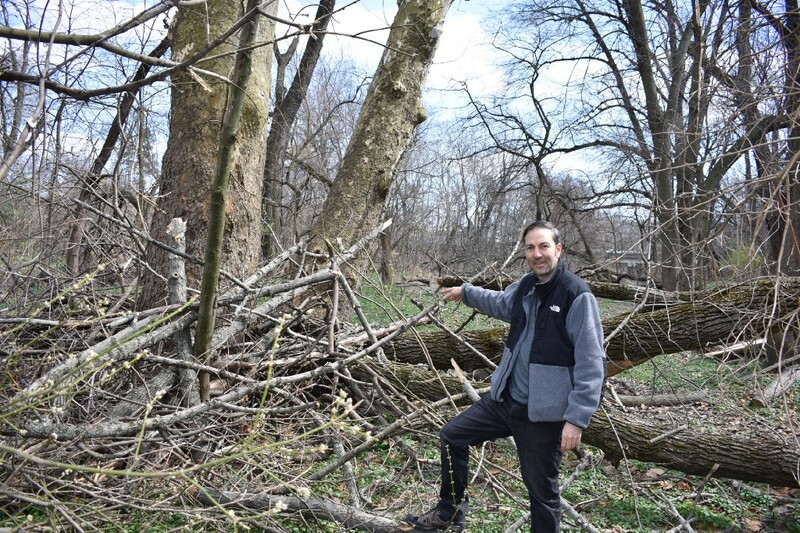 Walking through a stretch of Pennypack Park tucked away between Holmesburg and Frankford avenues, Jason Sherman is devastated to see a forked sycamore tree has been damaged by a fallen trunk. “Someone’s gotta fight for those trees,” he mutters as we hike back up the slope back to the trail, twigs and rotting leaves crunching under our feet. The fallen trunk landed in the sycamore’s fork; one trunk remained standing straight, but the other appeared to be bent at the roots. Bark is scraped away to reveal the white wood underneath, possibly meaning the fall trunk landed right on it and rolled down its side. We had taken a brief detour from our walk around historic Holmesburg, a route Sherman had mapped out. He wanted to show me a site he couldn’t include on his tour. After walking through the muddy path and passing under an old broken street lamp, it became obvious why. Fallen branches and overgrown sprouts snag at our clothes. The forked tree is one of the last surviving markers of the 1697 Pennypack Grist Mill. It’s where the nearby Mill Street got its name. A 1900s photograph of the mill’s remnants shows the double sycamore. It’s the hardest spot to reach on our tour, which is why it wasn’t included in Sherman’s app, but it’s well worth the view. We’re finishing up our hour-long tour of historic sites in the area, guided by the app “Sidewalk,” which gives detailed maps and trivia about the area that otherwise just looks like a typical neighborhood. As we walk, he tells me about everything else Northeast-centric he’s been working on. Since we last talked, plenty of progress has been made. Some of these projects aren’t ready for the public eye yet. But Sherman has a vision for the Northeast, and it’s coming along quickly. “This is just the beginning,” he said as we reached the trail again. Our tour starts at the King’s Highway Bridge, the oldest bridge still in use in the country. Of course, it’s not in use at the moment — it’s covered in web-like metal latticework as construction ensures it can continue to hold its historic title. “I guess you can click, ‘I’m here now,’ ” Sherman said. We both have our phones out. We take pictures of the bridge next to the whispering water of the stream under the bridge, which is somehow more symmetrically beautiful with the artificial additions surrounding it. This was the bridge that started it all for Sherman. He was torn between buying a house in the Northeast or in Fishtown — a decision, he said, that led him to create his documentary, The King’s Highway, about the area’s lush history. 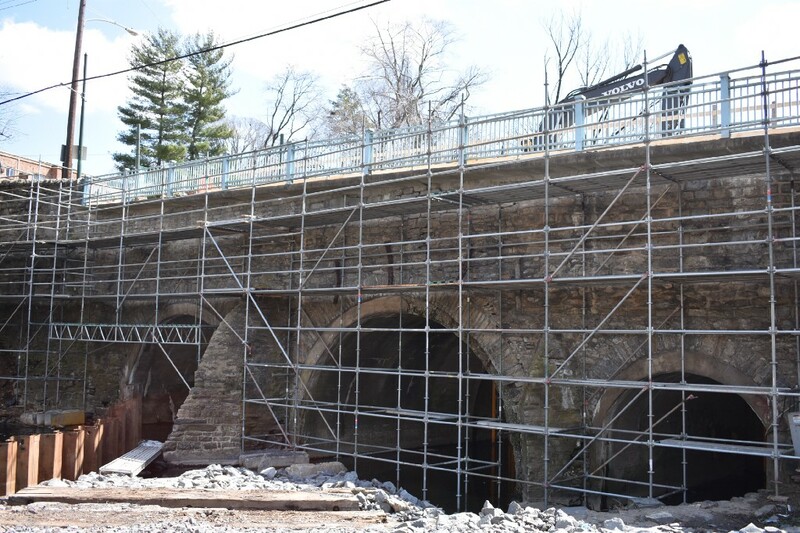 He ended up with a property close to the historic bridge, though wasn’t aware of its history until, by chance, he checked out an issue of the Times. In it was an article discussing the area’s lush history, which sparked his own interest. 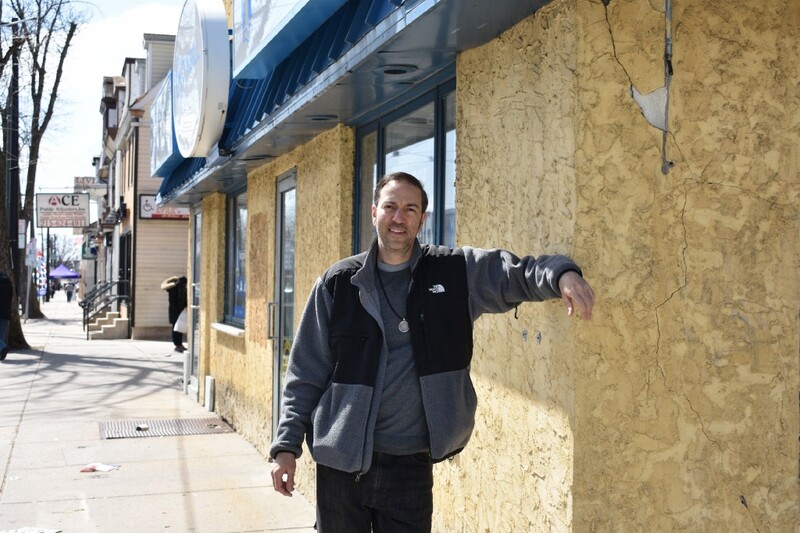 The property he was eyeing in Fishtown may now have a lofty price tag, but he can’t let that bother him. Every time the Times checks in with Sherman, it’s because he’s undertaking an ambitious new project related to the area. This time, there’s several. “Sidewalk” is guiding us to each stop. The Emmanuel Episcopal Church is third on the 11-stop tour. When you open the app, the King’s Highway Tour is the first thing you’ll see. Sherman said the creators wanted to show off the tour as an example of what the app can do — it’s meant to get you out exploring areas you wouldn’t normally. It’s like “Pokemon GO” for adults. Sherman’s tour is one of the first in Philly — currently, most take you to touristy spots in New York City. The app is available on iTunes and the Google Play Store. Once you’re at the bridge, you can start the tour. It will give you walking routes to the next stop as well as trivia and suggestions from Sherman. At the church, Sherman’s trivia encourages you to walk through the gravestones to see how far they date. There are plenty of familiar names on the stones — Castor, Hartel, Rowland, Fox. All names of people nearby roads have been named after. We find the stone of Elizabeth R. Warrington, wife of Andreas Hartel, the namesake of Hartel Avenue. She was born in 1830 and died just before the turn of the 20th century. It’s far from the oldest stone in the area, but what fun would it be if I spoiled it here? I stand in the middle of Frankford Avenue, cars whizzing just feet behind me, to capture the full building that was once a hotel with Sherman posing in front for a photo. The old Greentree Hotel is one of Sherman’s favorite buildings in the area. It’s owned by O’Neill Insurance Providers now, but back in 1799, the building at 7944 Frankford Ave. was used for weary Highway travelers to pause and to rest. The “Sidewalk” tour is just a small leg of the official King’s Highway tour, which has 59 spots to check out. Official maps of the full tour are now available at select locations, such as Stein Your Florist, Sharon Owens State Farm, Giggles Gifts, the Insectarium, Grey Lodge and Mayfair Diner. The maps were illustrated by Leigh Menkevich, whose father, Joe, works to get local sites historically nominated. One stop that’s on the official tour but not the walking tour is Lower Dublin Academy. Sherman is in early talks with the owner of the historic building to discuss logistics to transfer ownership to Sherman and the King’s Highway Foundation. As he told the Times before, he wants to convert the building into a museum that showcases history from every Northeast neighborhood as an “anchor” for the area. Still, there’s a lot to figure out with the logistics of making that happen. But two months ago, it was just a spec on the horizon. Now, it’s gotten a lot closer to reality. Sherman thanks the work of everyone involved in the King’s Highway Foundation and Northeast Philadelphia Initiative, including Mia Hylan, Tara Gontek, Teri Grumbrecht, Cathy Reynolds, John Cambridge and area politicians. He also thanks local historians Fred Moore and Lou Iatarola Jr.
Once we’re back on the trail after leaving the old mill site, the tour is mostly done. It took us about an hour, but we whipped through some of the stops, and meandered off trail. Sherman ponders about whom to contact to get the fallen trunk cleaned up. As we walk, he brings up a pipe dream. “This morning, I was having breakfast and I was just imagining being here in the 1700s,” he said. Even though it no longer remains, Sherman included the Washington House on his tours. Its history is something he laments over. It was built circa 1773 by John Holme, the founder of Holmesburg, and is thought to have been occupied in 1781 by George Washington on the march to defeat the British at Yorktown. The building was torn down in the 1920s to build the Holmesburg Theater, another ranting point of Sherman’s, as it was used as a theater for only a short time (it’s not known exactly when) before being shut down.